The holidays are not always filled with cheer. For some people it can be a time that causes mental health issues like depression. Money issues, loneliness, and high holiday expectations are just a few things that can lead to depression during the holiday season. 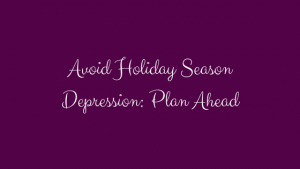 However, with a little planning you can defeat depression during the holidays. Here are a 5 exceptional ways to make this holiday season more cheerful. If you know you may be a little depressed during the holidays, it is best to begin planning ahead. Taking care of yourself is important and setting up routines to make sure you do just this can be a big help. Scheduling a bit of “you time” to read a book, take naps, or enjoy time doing a hobby you love is a good strategy for the holidays. Make a depression fighting calendar with these times scheduled to keep you on track. If you are feeling anxious about holiday season family gatherings due to potential conflict, think about how you can avoid the issue. 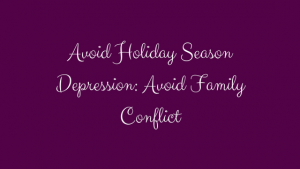 There are a few excellent tactics you can employ to keep family gathering conflict and depression free. First, have neutral responses planned out ahead of time. When questions arise you don’t want to discuss you can simply say, “Let’s talk about it some other time.” Make yourself useful as well, because staying busy can keep you out of conflict. Help in the kitchen, wrap presents, or just escape to a quiet place for a few minutes to avoid those conflicts. 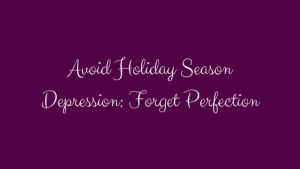 Sometime the perfection associated with the holidays can worsen your depression. Just try to remember that not everything needs to be perfect and it is normal to go with the flow. Giving back is a great way to keep depression at bay during the holiday season. Volunteer at a local children’s hospital or homeless shelter and give the gift of giving to help you feel better. Sleep does wonders for your mental state, so be sure to get plenty of sleep during the holidays to stay fresh and not depressed. 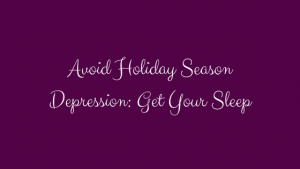 Studies have found a connection between lack of sleep and depression, so o your best to get that much needed holiday season rest. Set a bedtime and wake up call for the same time each day and be sure to stay away from sugary foods and alcohol a few hours prior to bedtime. This will help your body and mind come down from the holiday festivities naturally, allowing you to get the sleep you need and deserve. 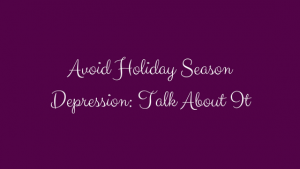 Depression is common, especially during the holidays. This means that you are certainly not alone and talking to a friend, family member, or doctor to help subside those feelings of depression is a recipe for better mental health. You can always reach a doctor via our free online doctor chat 24/7 regardless of the time or holiday. Talk through your depression, anxiety, or other mental health concerns with a professional and learn to build routines for a cheerful holiday today. Simply click the button below and get started today.